PokerStars embarked on a summer-long tour of California to promote Internet poker in mid-July, and this week the road show that is crushing rumors surrounding online poker visited the grape-crushing mecca of Napa Valley. 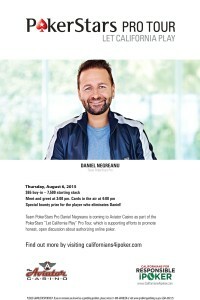 Armed with its brand ambassadors Daniel Negreanu and Chris Moneymaker, the Let California Play tour descended on the Napa Valley Casino last Saturday as part of the Californians for Responsible iPoker coalition. The group backed by PokerStars and a coalition of tribes, card rooms, and businesses, is dedicated to informing the public that a regulated iPoker market is much-needed to both grant players who wish to play online the ability to do so, and protect those who are already playing. The tour has been a smashing success, as poker players and fans are turning out in flocks to see some of the most marquee names to ever sit down at the felt. Vanessa Selbst, Jason Somerville, and Liv Boeree have also made appearances during previous stops. In addition to talking about the benefits of a legalized online poker market, Negreanu and Moneymaker also participated in a $335 buy-in tournament and rotated tables, giving all players the rare chance of sitting at the same table as the two legends. The tour continues to Citrus Heights on August 2nd, Delano August 6th, Rosamond August 7th, Fresno August 8th, and Turlock on the 9th. Though the coalition’s campaign is causing a buzz across the state, legalization doesn’t seem to be gaining momentum in Sacramento. Two assembly bills were introduced in 2015 by Assemblymen Mike Gatto (D-District 43) and Reggie Jones-Sawyer (D-District 59), and a third “shell bill,” a placeholder more or less, was brought to the floor by Assemblyman Adam Gray (D-District 21) in February. Jones-Sawyer’s bill is believed to be scheduled for a hearing in the coming weeks after the assembly returns from its Summer Interim Recess, but with California’s Interim Study Recess starting on September 11th, little time will be available to push through an online poker bill. But optimism remains, largely thanks to PokerStars’ campaign to get out the word that legalized iPoker is safe for consumers and financially rewarding for government. Economists have estimated that the state could receive $500 million annually from a mature Internet poker industry, and while not all online gaming forecasts have panned out, that’s still substantial enough that lawmakers must consider propositions in 2016.